The band’s previous album, received critical acclaim worldwide and was helped establish the band as an intriguing discovery for fans of the progressive rock genre. The first seven songs of the band’s new album SHIP are a suite based on the Greek mythology “ARGO”. The opening song “Tears of the Figurehead” is sung by special guest singer Sonja Kristina of Curved Air. Band member Shun Taguchi said: The last song “Did You Find A Star?” was originally planned to sung by John Wetton, but he passed away from cancer and at first we planned not to include it on the album. However, although unfortunately our dream didn’t come true, we decided to still record the song for the album as a tribute to him. Let’s enchant with Yuka & Chronoship’s music video! 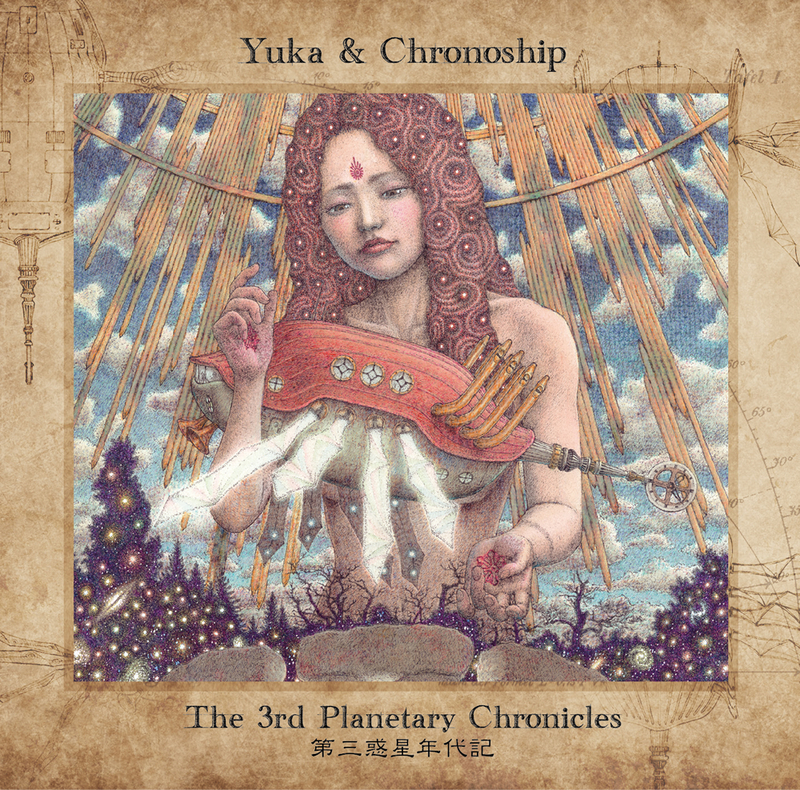 In September, 2015, Yuka & Chronoship made their UK debut with their 3rd album, “The 3rd Planetary Chronicles”. Since then, there have been so many requests for the album’s music video from the fans and the media overseas, that the band now decided to make the music video to extend their popularity. Yuka & Chronoship is a Japanese progressive rock band whose 3rd album, “The 3rd Planetary Chronicles”, released on Cherry Red Records in the UK in September 2015, garnered rave reviews worldwide. Yuka & Chronoship is the first Japanese artist to release its album on a large independent label in the UK, the birthplace of progressive rock, ahead of a domestic release in Japan. Since its release, the album has received enthusiastic responses, especially in UK and other European countries, where the album has been rated with four and five stars from the media. In no more than two weeks after the release, the CD’s first pressing had sold out and was picked up by more than 70 radio stations and internet media outlets. The music video that we want to make through this funding opportunity is intended to go beyond the category of “music video” primarily comprised of scenes of performance. It should be a visual work of art that delivers the worldview of the music. The video’s production director is Masako Gomado, a reputed VFX artist that had worked in a variety of visual media including Japan’s national TV network’s long running, one year long drama series and the movie, “20th Century Boy”. The art work is provided by Oda Hideji, the manga artist and illustrator that created the excellent artwork for the band’s 3rd album. The music video should be a highly creative attempt to present the worldview of “Galileo II – Copernican Theory” through the collaboration of music, artwork, and VFX! Yuka Funakoshi (Keyboard/Vocal/Composition) – As a singer-songwriter, Yuka had released three J-pop albums from Pioneer LDC and Sony; Shun Taguchi (Bass/Keyboard/Producer) – He has been working as a producer of Yuka Funakoshi since her debut, and had also worked as a producer of Princess Princess, a five-piece Japanese pop/rock girl band. He is also a reputed lyricist in Japan; Ikko Tanaka (Drum) – Ikko had worked as a tour and session drummer of B’z, a Japanese rock duo; Takashi Miyazawa (Guitar/Mix) – Takashi had worked as a studio musician for some projects led by Masataka Matsutoya, a Japanese arranger, composer, music producer. Yuka & Chronoship’s 1st album, “Water Reincarnation”, was released in June 2011, and their 2nd album, “Dino Rocket Oxygen”, in April 2013 in 31 countries from the French progressive label, Musea. Since 2009 when the band was formed, Yuka & Chronoship has been periodically playing mainly at live music clubs in Tokyo. In May 2013, the band appeared at Prog’Sud 2013, an annual progressive rock festival held in Marseille, France. In August 2014, the band was featured at Festival Crescendo 2014 in St.Palais-sur-Mer, France. In September 2015, Yuka & Chronoship will play at 2Days Prog+1 2015/Veruno Prog Fes in Italy. Japan – Much to the excitement of music fans worldwide, the new album by Japanese Prog Rock Band ensemble Yuka & Chronoship will be released on September 25, 2015 via distributor Cherry Red Records Ltd. in the U.K. Titled “The 3rd Planetary Chronicles”, this is marks the third album by the group and promises to take you on a celestial musical journey! The setting of the band’s new album is the Earth or the third planet from the Sun. “The 3rd Planetary Chronicles” is a grandiose concept album themed with scientific/technological revolutions in the human history. The CD booklet is designed by Hideji Oda, a Japanese manga artist associated with the Nouvelle manga movement, known for “Dispersion”, “Coo’s World”, and “Miyori’s Forest”. Yuka Funakoshi (Keyboard/Vocal/Composition) – As a singer-songwriter, Yuka had released three J-pop albums from Pioneer LDC and Sony; Shun Taguchi (Bass/Keyboard/Producer) – He has been working as a producer of Yuka Funakoshi since her debut, and had also worked as a producer of Princess Princess, a five-piece Japanese pop/rock girl band. He is also a reputed lyricist in Japan; Ikko Tanaka (Drum) – Ikko had worked as a tour and session drummer of B’z, a Japanese rock duo; Takashi Miyazawa (Guitar/Mix) – Takashi had worked as a studio musician for some projects led by Masataka Matsutoya, a Japanese arranger, composer, music producer. Yuka & Chronoship’s 1st album, “Water Reincarnation”, was released in June 2011, and their 2nd album, “Dino Rocket Oxygen”, in April 2013 in 31 countries from the French progressive label, Musea. Since 2009 when the band was formed, Yuka & Chronoship has been periodically playing mainly at live music clubs in Tokyo. In May 2013, the band appeared at Prog’Sud 2013, an annual progressive rock festival held in Marseille, France. In August 2014, the band was featured at Festival Crescendo 2014 in St.Palais-sur-Mer, France. In September 2015, Yuka & Chronoship will play at 2Days Prog+1 2015/Veruno Prog Fes in Italy.